Even though in the past superhero comics were mainly aimed at kids, there weren’t a lot of child characters that were superheroes. Sometimes kids, or shall I say teens, were sidekicks, like Batman’s Robin. 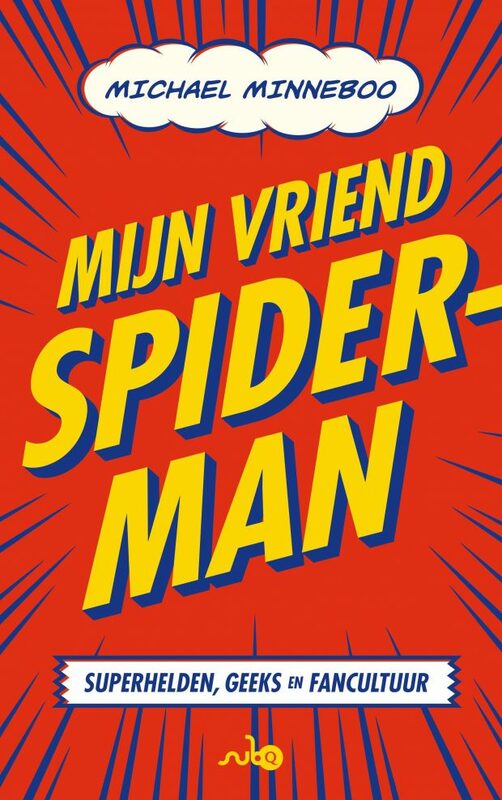 When the Amazing Spider-Man was introduced in 1962, it was the first time a teenager became the hero. And what a smash success it was, and to this day, still is. Since then, teenage superheroes are a lot more common. DC Comics has The Teen Titans for instance, and Marvel The New Mutants and Power Pack, which is a team that consists only of kids. 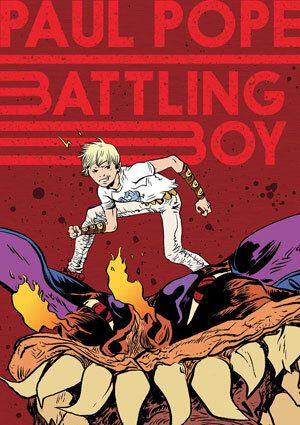 Now American comic book writer/artist Paul Pope (THB, Batman: Year One Hundred) brings us Battling Boy. The city of Arcopolis is ruled by fear: monsters roam the city streets and a gang of terrorists, lead by a ghoul named Sadisto, is kidnapping children. When the city champion Haggard West is killed, his sidekick daughter Aurora tries to step into West’s footsteps. Unknown to her, the demigod Battling Boy is sent to Earth by his parents on the eve of 13th birthday. It’s time for the boy’s ‘rambling’: in their culture, the rite of passage into adulthood consists a trial which teen boys must undergo. For Battling Boy this means it is up to him to fight the monsters and make Arcopolis a safe place again. Twelve enchanted T-shirts that imbue him with the powers of animal totems, a special cloak and an invisible credit card are the boy’s tools in accomplishing this immense task or die trying. 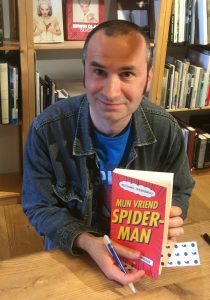 Because Pope aims at teenagers, it is not surprising that most adult characters in this book – except the heroic Haggard West and Battling Boy’s parents – are either sleazy politicians like the major of Arcopolis, helpless parents whose kids get kidnapped or baddies who do the kidnapping. The mayor of the city tries to score points with his constituency by organising a big parade to introduce the new hero as ‘Arco-Lad’, who he the tries to use as a stooge. Here Pope shows his mistrust of institutions, bureaucrats and button-pushers, also seen in earlier work like Batman: Year One Hundred and The Ballad of Doctor Richardson. In Battling Boy he translates this theme into a worldview that must appeal to adolescents who by nature rebel against their elders. For Battling Boy it seems safer to mistrust adults all together, since none of them seem to be reliable partners. Let’s hope Aurora is able to give the lad a hand since Boy’s first fights with evil are anything but flawless. I thought the people of Arcopolis were actually quite passive and seemed to be in a constant need of saving. This set-up might be a great stage for a kid superhero, but seems a bit too contrived for my taste. The story raises a couple of questions, like where do the monsters and ghouls come from, but Pope doesn’t address these in this first instalment of Battling Boy. Since this volume is only part one of a series, and not a completed story, I suspect answers will be given in future chapters. Be advised that after reading some 200 pages, a cliffhanger is waiting, leaving you wanting more. Besides these minor points, Battling Boy is an entertaining, accessible, fast-paced coming-of-age story disguised as a superhero yarn dipped in some magic sauce, and actually quite entertaining for adults as well as kids.